«Adrian Smith + Gordon Gill Architecture Win Expo 2017 Design Competition. 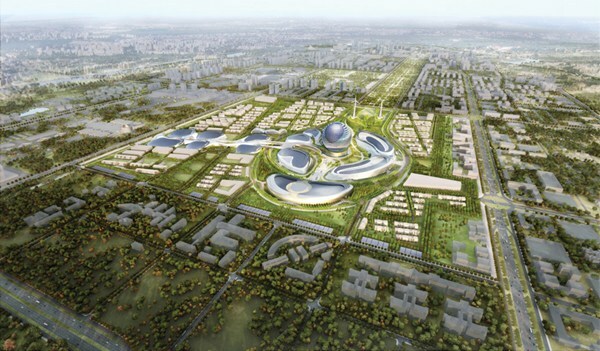 The Chicago-based firm was selected to design the expo in Astana, Kazakhstan». Lo studio Adrian Smith + Gordon Gill ha vinto il concorso per lʼExpo 2017, dedicato al futuro dellʼenergia, battendo i competitori, tra cui Zaha Hadid, FAIA, Moshe Safdie, FAIA, Gordon Smith, Snøhetta, Coop Himmelb(l)au, Mecanoo, Jürgen Mayer H.
«The Capital Cities of the Future. Could great architecture solve geographic conflicts?». «Astana: The world’s weirdest capital city».